Wow your guests at your next get-together with this easy-to-assemble cheese board! 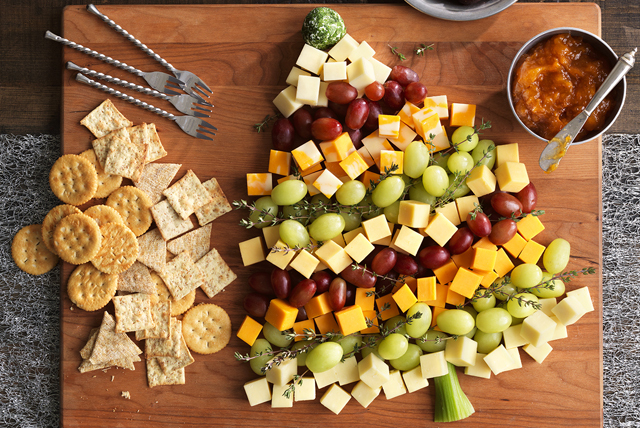 Arrange cheese cubes and grapes in rows on platter or cutting board to resemble a Christmas tree shape, ending with a row of mozzarella at the top. Add thyme sprigs between rows as shown in photo. Roll cream cheese product into ball, then coat with parsley; place at top of tree. Place celery at bottom for the tree trunk. Prepare using other flavours of Cracker Barrel Cheeses, such as Gouda, Swiss or Medium Cheddar. Substitute cherry tomatoes and/or olives for the grapes. Serve with your favourite assorted Christie Crackers.